I've said it before, but I'll say it again - there is a lack of diversity when it comes to food in the GVRD. Woah... Wait a minute, what are you talking about??? Some would argue that Vancouver sports possibly the most ethnic cuisine in North American. Yes, that may be true, but consider this - the selection of ethnic cuisine is predominantly Asian. Nothing wrong with that, but some of the other options are lacking. Of course this has plenty to do with demographics, however certain cuisines are poorly represented. One of them is Afghani food. Unlike Fremont, California (lots of relatives there, I go often), one could count on one hand the number of restaurants in the GVRD (Afghan Horseman, Afghan Chopan, Afghan Kitchen and Afghan Bakery). Well, we can add one more in Pamir Diner out on Scott Road. Miss Y and I decided to check it out for an early dinner. So probably the best dish we had, arrived first, in the Mantu stuffed with ground beef, onions, and spices topped with special house sauce and mint yogurt. 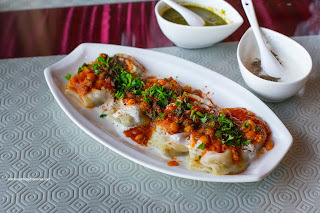 Soft and tender with an appealing elasticity, the dumpling skin had good mouth feel. Inside, the ground beef was moist, tender and peppery. The garlicky tomato sauce on top was nicely accented by the cooling yogurt. Lots of good textures and flavours going on here. 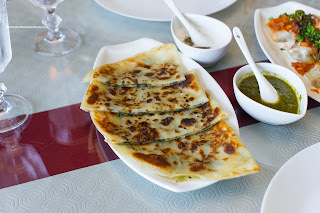 Next, we had an order of the Leek Bolani stuffed with leek and green onion and house spices pan-fried and served with yogurt and chutney. This was pretty standard, if not a bit more doughy than other bolanis I've tried. It was still fairly tender and nicely browned. There was just enough leek and onion for flavour and texture without going over the top. 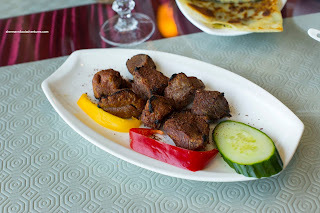 Onto the meats, we had both the Pamir Chicken and Lamb Tikka Kabobs. As you can clearly see, the chicken was marinated and beautifully charred. 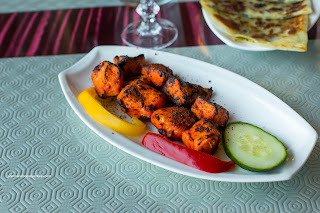 On the outside, the chicken was completely caramelized with an almost crispy crust. There was some spice, but completely amped up with the cilantro chutney on the side. We found the meat to be a bit dry though, but excusable since it was all breast meat. Of the two, we thought the lamb was the best. Also exhibiting the same crispy crust, the lamb wasn't as charred. Now that didn't mean it wasn't flavourful though. It was well-marinated and wasn't overly gamy. The meat itself was succulent and tender. 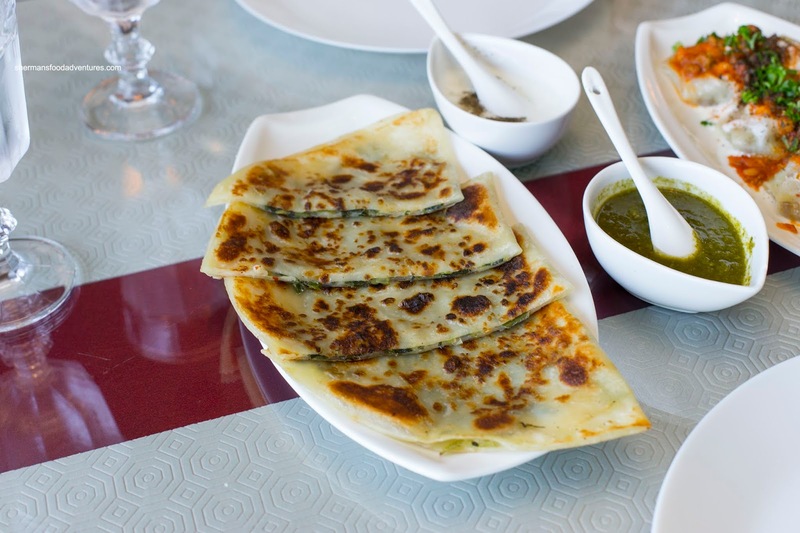 I enjoyed eating this with the cilantro chutney and yogurt. 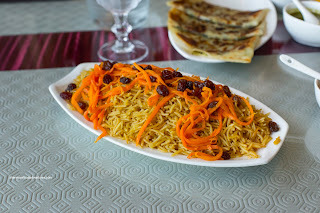 As a side, we added the classic Kabuli with the usual raisins and seared carrots. The basmati rice was fluffy and flavourful without being overly greasy and salty. I loved this rice since the pop of the sweet raisins and carrots really add a balance. I could just eat this all by itself without any mains. Too bad we weren't hungry enough to order the lamb shank because this goes so well with it. Where is Mijune when you need her? 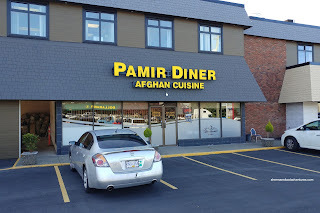 Overall, we enjoyed our meal at Pamir Diner. I'm not sure if it is any better than Afghan Chopan, but it provides an alternative.